Well the Hot Stove season certainly seems to have cranked up early. The Florida Marlins have made two trades, their star second baseman and their center fielder for three middle relievers and a glorified utility player. Meanwhile the Oakland Athletics have stuck with their recent pitching and defense first strategy, except they seem more willing to spend money than they have been in decades. The San Diego Padres want to win despite their budget and they just might. As usual the Atlanta Braves are fearlessly re-shuffling the deck and stretching their resources to strengthen their contending team. The Kansas City Royals sent outfielder David DeJesus to the Oakland Athletics for lefty reliever Justin Marks and right-handed starter Vin Mazzaro. The last few seasons have seen the Oakland Athletics move a few steps away from the emphasis on on-base percentage and power that made the organization famous after Moneyball: The Art of Winning an Unfair Game became a huge hit. Those that actually read the book and listened to general manager Billy Beane, understand that it was never about OBP. It was about exploiting weaknesses in the market. Presently, if the composition of the Athletics roster tells us anything, the A's are looking for quality defensive players that are major league average offensively. David DeJesus fits into that mold almost perfectly. ***The Athletics also seem to be exploiting the prejudice against players with injury history, DeJesus fits into that mold as well. The Kansas City Royals have been dangling DeJesus as bait for almost a year. He has a competent bat capable of producing from various spots in a lineup and plays very good defense in the corner outfield spots. He makes extremely good contact with the ball and hits lots of line-drives with mediocre power, typically in the 8-12 homer range (he's capable of hitting around 20 homers in the right park, the Oakland Coliseum is not it). He has slightly above average speed but is a poor base stealer, which will probably reduce his steal totals in Oakland to none. DeJesus possesses outstanding plate discipline and would make an excellent number three hitter for the Athletics. He could very well pile up the RBI batting behind Oakland's speedy outfielders Rajai Davis and Coco Crisp (if healthy). Both Vin Mazzaro and Justin Marks have above average stuff but neither has been seen that stuff translate into above average results. Mazzaro came out of the minors with a powerful sinker that in the majors has failed to induce grounders. Without either groundballs or strikeouts he has depended almost entirely on the excellent defense of the Athletics. Unfortunately for Mazzaro, the Royals defense has been nearly as good. Mazzaro still has excellent potential but needs to work on locating his sinker better to induce those grounders. If the Royals can help him with this, they may have done very well acquiring Mazzaro alone. Fantasy owners looking for cheap starters to get lucky with could do a lot worse than Mazzaro. Justin Marks has nice strikeout stuff but has struggled with a groin injury that required surgery in 2009. He was slowed to start 2010 because of it and his initial results proved that he had quite a bit of re-adjusting to do. (Re-Adjusting, was that funny? I can't decide...) Marks does have excellent potential and is one to watch. The Boston Red Sox traded lefty relief prospect Dustin Richardson to the Florida Marlins for the disappointing (but still potential laden) left-handed pitcher, Andrew Miller. Dustin Richardson has two great fastballs and a decent slurve but has struggled to gain command over his pitches. He will pitch in 2011 at 27-years old. He has potential but is running out of time to make use of it. This is not dissimilar to the man for whom he was traded. The difference is Andrew Miller was supposed to have even greater potential. The Red Sox do have excellent teachers in their system but I would bet against Miller having a fantasy impact this season. The Red Sox gain the player with the greater potential. The Marlins get a similar player who may be fired up to play for a team that may actually have a spot for him. But I expect Richardson will be little more than a lefty specialist who isn't all that great at his job. The San Diego Padres send right-handed relievers Edward Mujica and Ryan Webb to the Florida Marlins for center fielder Cameron Maybin. The Marlins struggled with their bullpen in 2010. They obviously needed some help in that area and Edward Mujica and Ryan Webb are pretty good additions to their bullpen. But I do not understand why they decided to send the incredibly gifted Cameron Maybin to the Padres to acquire them. It seems like a massive overpay to me. Cameron Maybin has not been good in his brief major league stints but has shown some real progress in the minor leagues. He will never be a real power hitter hitting as many ground balls as he does, but in Petco that's almost to be expected. He does have power potential, if he can adjust his swing to add power to the gaps he can be an extremely effective player for San Diego. For the Padres he should play pretty good defense in center field and has the potential to be a dynamic leadoff hitter. His plate discipline is approaching average in the major leagues. He actually needs to be more aggressive in my opinion. He watches a lot of pitches go by and swings at far fewer in the strike zone than the average hitter. I think in a full season he could hit for a decent (.265-.275) average with a bit of power (the 8-12 homer range I guess) and 20-30 steals. Bill James is projecting .277/.349/.424 with 14 homers, 85 runs, 60 rbi, 20 sbs, 7cs which would make the Padres extremely happy. I think Maybin owners would be pretty happy with it as well. Mujica is a good middle reliever with excellent control but has had problems keeping the ball in the park. This problem will only get worse moving out of Petco. He has some value in deeper fantasy leagues but shallow-mixed league owners probably won't gain anything by owning him. Ryan Webb is a potential closer candidate. He has a decent (not great) strikeout rate complemented by pretty good control and the ability to induce groundballs at an above average rate. The Marlins have Leo Nunez in the closer role in the short term but I can see them making a change in the long term to Webb. That makes him a nice reserve round or dollar days pick-up. The Atlanta Braves traded power lefty reliever Michael Dunn and Utility Infielder Omar Infante to the Florida Marlins for second baseman Dan Uggla. The Atlanta Braves sacrifice some defense to put their three year need for a right-handed power bat to rest. 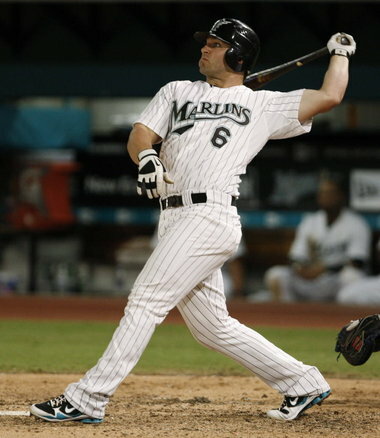 Dan Uggla has averaged 31 homers per season in five major league seasons. He is coming off his best season having hit .287/.369/.508 with 33 homers, 100 runs, 105 rbi and four stolen bases. Uggla experienced a career high BABIP of .330 in 2010. When compared to his career BABIP of .302 it appears he was pretty fortunate to hit for as high an average as he did. However, Uggla is an extremely disciplined hitter who swings at very few pitches out of the strike zone and makes good contact within the zone. However, his batting average suffers because he hits the majority of his pitches into the air which results in far more flyouts. Uggla is moving into a much better homerun park and could see a significant boost to his power numbers. His batting average could even be aided by seeing a larger number of his flyballs leave the park. He should also have a much better lineup around him with Martin Prado, Jason Heyward, Chipper Jones, Brian McCann, and promising rookie Freddie Freeman (not the boy who becomes the super-hero...Captain Marvel Jr.). They should help Uggla pile up lots of RBI opportunities. Martin Prado becomes the left fielder, a position he has apparently played in the Venezuelan Winter League. For a year at least he should have nice dual position eligibility in most leagues. Omar Infante has had a few nice seasons since coming to the Atlanta Braves from the Detroit Tigers. He has very little power but makes a lot of contact with the ball. He has fairly average plate discipline but refuses to take walks. He isn't a great defensive player but is not a liability which is a huge defensive upgrade over Uggla for the Marlins. But without any power or even speed to contribute he is probably miscast as an everyday player. His fantasy value depends on his BABIP staying high as it has the last couple of years, which results in strong batting averages. He won't contribute in any other fantasy categories. Mike Dunn is a decent strikeout loogy but has poor command. He is unlikely to have any fantasy value. Oakland Athletics claim Edwin Encarnacion off waivers from Toronto Blue Jays. "The Oakland A's are excited to have had our bid for Hisashi Iwakuma accepted by the Rakuten Golden Eagles," the team said in a statement. "Out of respect for the posting process and for Mr. Iwakuma and his representative, we will not have any comment until the 30-day negotiation period comes to an end." The A's continued a busy offseason by reportedly signing Vicmal de la Cruz, a sought-after center-field prospect from the Dominican Republic. The A's also inked third baseman Renato Nunez of Venezuela in early July for $2.2 million and signed top Venezuelan catching prospect Argenis Raga later that month. Boston Red Sox claim Taylor Buchholz off waivers from Toronto Blue Jays. St. Louis Cardinals signed free agent RHP Jake Westbrook.